Donate to Help Parrots in Need! All proceeds from the these partnerships and sales will directly fund the rescue and rehoming efforts of Connecticut Parrot Rescue. Contact us to partner with us or for more information. Donate gently used items or shop for some great items at deeply discounted prices - another easy way to support CTPR! Snug as a parrot in a fleece hut! Personalize your parrot's sleeping hut with SewlyInspired. 20% of the profits will be donated to CTPR when you mention us! Pannya specifically created these awesome parrot magnets and stickers to support CTPR! £1 (UK pound) will be donated from every sale! Visithttps://www.etsy.com/uk/shop/pannyaand search parrot. Trivets, Cutting Boards, Coasters, Canvases and Lazy Susans!http://www.laurenehuntdesigns.comare fun and colorful. Mention ""Referred by CT Parrot Rescue in the shipping area under Company (optional)" section and 10% will be donated to CTPR! The Pet Assure Discount plan starts at $79 for a full year for a single pet. Receive $10 off when you use this link: http://www.petassure.com/go/cpr.html. Pet Assure has no medical exclusions and no waiting periods; you can start saving right away. Every member receives 25% off all in-house medical services provided by our participating vets. Silverpasta creates some of the cutest parrot (and other animal) figurines we have EVER seen! Tell them you discovered their store here and 20% from each sale will be donated to CTPR!! Visithttps://www.etsy.com/shop/Silverpasta today and let them know we sent you. Fully cultomize-able fun jewelry for all ages, all occasions, moods and outfits! 20% from each sale is donated to Connecticut Parrot Rescue. Select CT Parrot Rescue at checkout! Taste the tea and coffee that fuels our volunteers on a daily basis! YUM! Each coffee, tea, reusable k-cup and biscotti purchase directly benefits CTPR! Change the way you search online. Simply select Connecticut Parrot Rescue as your preferred cause and make www.goodsearch.com/goodshop-invite/samantha-pitera-259350 your go-to search engine and we'll earn 1c for every search you do. Take a walk with us! Download the ResQwalk App and select Connecticut Parrot Rescue as your benefiting organization. Then check-in at the beginning of your walk, and check-out when you're done. We get a % of the week's donation pool and you get free coupons from sponsors! Change the way you shop! Sign up and download the app on your computer and mobile devices. Select Connecticut Parrot Rescue and then shop at your favorite retailers. A % of your purchases will benefit CTPR. Put up a fundraising lemonade stand. 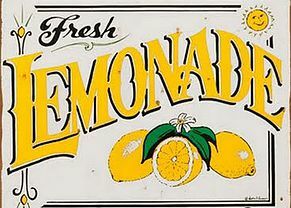 Sell your lemonade for 25c a cup, and ask people to round up to $1 to donate to your favorite rescue... CTPR. Contact us for flyers. Improve your life and that of the the CTPR birds! Have friends and family members sponsor each kilometer/mile you run in a local race (5k, 10k, marathon - WOW!) and donate to CTPR. Contact us for 'sponsor me/donate to CTPR' signup sheets. Organize a can and bottle drive at your local school, job, community group or even in your neighborhood! 5c per can adds up quickly. Contact us for flyers and related items. Several companies match their employees donation to non-profit organizations. If your employer provides matching donations, please let us know. This is an easy way to double your donation.